Ryan finally opened his Easter gift yesterday, about a week after Easter. He devoured his skittles, M&M’s and lollipops, the only three candies Ryan likes. (Children on the spectrum are very particular about what they will eat.) But he would not touch his wrapped present. He has to be in the mood to open it. And I have to tell him what’s inside, because he doesn’t like mysteries. How does he know a snake won’t jump out at him? In a way, buying presents is easy for many parents of children on the spectrum. We don’t have to buy them. Many children with autism just aren’t interested in toys. Presents never had a lot of meaning to Ryan. But I, like many other parents I’ve talked to, just can’t not put a present or two under the tree at Christmas or a present in the Easter basket. Again, Ryan has to be in the mood for present opening. That happened yesterday. And, as he gets older, he’s finding that he actually likes the presents he’s unwrapping. He loved the basketball hoop that can be placed over his bedroom door. Ryan fell in love with basketball after participating in “All American Athletes,” a local non-profit program for special needs children that meets weekly and teaches kickball in the fall, basketball in the winter, and t-ball in the spring. I’m so thankful for that program and the volunteers that helped Ryan become interested in sports. 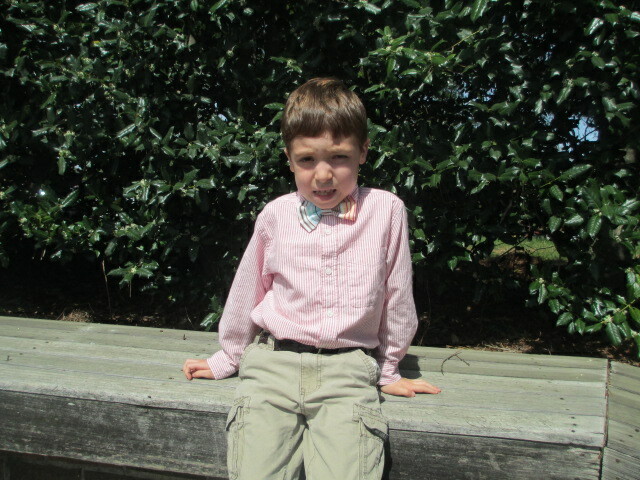 Easter is a little different when you have a child on the spectrum. We were careful not to mention the Easter Bunny, because Ryan would only worry about a large bunny entering his house in the middle of the night and making a lot of noise. But on Easter morning, we told Ryan that he had an Easter basket. He wasn’t the least bit interested and ate his breakfast and got dressed before he even glanced at it. He didn’t really look at it until after church. By the way, Ryan LOVES church. We couldn’t be happier. Ryan loves the structure and the predictability of it. He now likes the music (the organ used to be too loud), the children’s sermon at the front of the sanctuary, and Kid’s church. Ryan is finally walking to the front of the church on his own when it is time for the kid’s sermon. In the past, I walked him up the aisle and showed him where to sit on the floor in the front. The first time, Ryan wanted to run up onto the stage and join the choir. But now Ryan is walking to the front all by himself and actually telling me not to come. Church hasn’t always been this easy. We could attend church when Ryan was young enough to be in the nursery. But when he got too big, we faced a lot of opposition from our little boy who is sound sensitive and couldn’t handle the organ music, the singing choir, or the amplified voice of the minister. For awhile, we just didn’t attend church. Then, when we felt he was ready, we slowly introduced him to the church service. We walked through the sanctuary on a Saturday when it was empty. He sat in the lobby of the church several Sundays where it wasn’t as loud but he could hear the sermon and music. Ryan’s ABA therapist came to church a few times and helped Ryan get used to the service. Now Ryan is a pro at going to church and loves it. Sean and I spent our Easter laughing about our silly little boy who loves going to church, but has no interest in his Easter basket or present. Life with Ryan and his unique, creative brain is not bad, just different. We wouldn’t change it for the world. Categories: Holidays | Tags: autistic brain, Easter and Autism, going to church, no interest in presents, sound sensitive, toys and autism | Permalink. 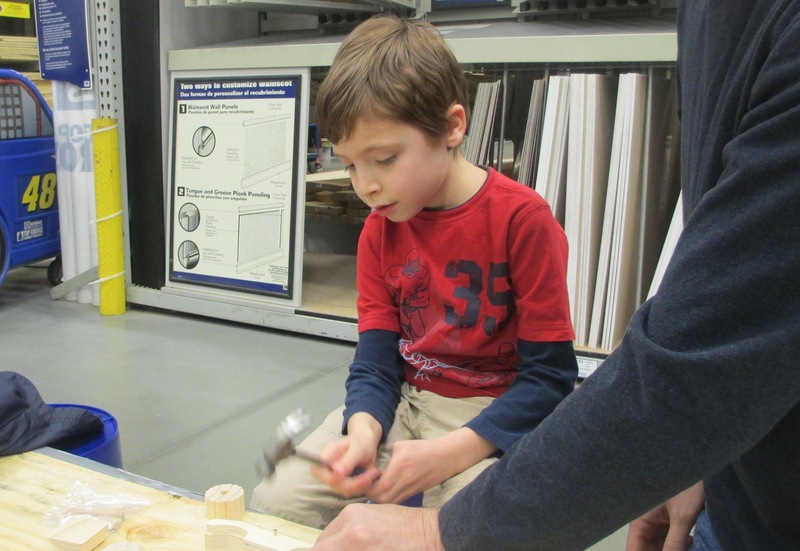 This past Saturday, we took Ryan to Lowes for a kids’ woodworking project. Afterwards, I realized just how much he changed in a year. The first time we did a project, Ryan’s ABA Therapist came along since he really did not want to go. But I was determined to get Ryan out of his comfort zone. He needed to spend more time out in the community where his surroundings might be a lot more stimulating than what he experienced in his own home. We guided him towards the back of the store where we could hear all the hammers loudly banging. Ryan had his hands on his ears and would have run back out of the store if it wouldn’t have been for his therapist. He did make his project, when we could convince him to let go of one of his ears and hold the hammer. The second time, Sean and I took him. We walked with him to the back of the store, and as soon as we let go of Ryan’s hand, he bolted down the aisle. I ended up chasing him through the store. We finally got him to sit down and we put a hammer in his hand. I’m not proud to say that he threw it across the table and almost hit another child. We ended up leaving and completing the project at home. We decided to wait awhile before trying another project. But, this past weekend, we tried again. It was almost a year later. Ryan was excited about making a woodworking project. We walked into the store and let go of Ryan’s hand. He wanted to walk by himself. It’s a habit to hold Ryan’s hand everywhere we go since he is a runner and will bolt right into traffic without a thought. Lately, I’ve been letting go more and more. Even in the parking lot. He headed over to the box of hammers with a smile on his face. 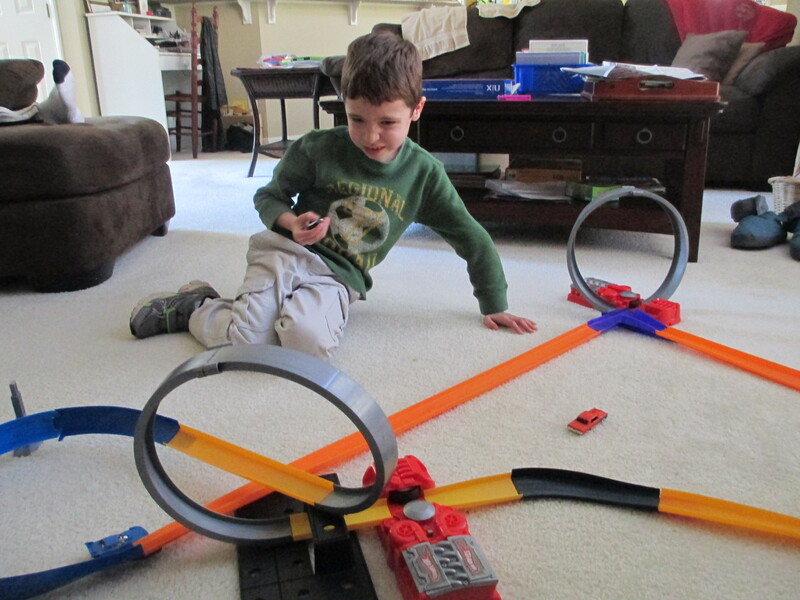 He carried the hammer and monster truck project to the table and sat down. He worked on hammering the nails by himself. He was proud of his project in the end, even though it might not look like if from the pictures. Ryan is determined to frown or look away for every picture. In fact, he had to be photo shopped into his first grade class picture because he kept turning his head around. It’s so important to celebrate the small victories. It’s easy to forget what it was like a year ago and to focus on all the things Ryan still has to work on right now. I know that any type of improvement means that Ryan is learning and growing. I encourage all the autism moms and dads out there to keep a short journal of what your child is doing. Then look back at the entry from a year ago. It will make your day to see how much your child has changed. And your child WILL change, as much as it seems like he will stay the same forever. Categories: Milestones | Tags: ABA therapist, anxiety sensory integration disorder school, autism, autistic brain, sound sensitive, victories | Permalink. I asked Ryan where he heard that word, but he didn’t answer me. Ryan answers questions maybe 50 percent of the time. It depends on if he feels like it at the moment, or if we continue to ask him the question until he answers it. Ryan truly has to be in the mood if he’s going to talk. Of course, he probably heard the word autism from us. We’ve talked about it before, And I’m sure there are many times Ryan has picked up on what we were saying when we thought he wasn’t listening, wasn’t interested, or wouldn’t understand. Ryan has always understood. That was his strong point, even when he was three, and only just beginning to say some words. He could have heard the word “autism” at school or during therapy. That was the end of our conversation. But I know it will come up again. Is Ryan starting to notice that he’s different from other children? Or is he just repeating something he heard? Ryan is on the high functioning end of the autism spectrum, so he is verbal. But his speaking often consists of scripting (repeating things that he heard before over and over), or repeating things that he’s interested in over and over. We are working on teaching Ryan how to have a real give and take conversation. We have to teach him how to greet people and say goodbye. And Ryan asks a lot of questions. So what could be going on inside his head? That’s something we ask everyday. We just wish we knew what he was thinking. But we do know he understands a lot and that he’s always trying to figure something out, whether it’s why a word has a capital letter or why a word isn’t spelled the way it sounds. One of Ryan’s obsessions right now is spelling and capitalization rules. He suddenly gets interested when he sees a word in print and the rules have been broken. I think the next step is to tell Ryan he has autism. I know the conversation will come up naturally when Ryan is ready. When that happens, I’ll let him know that he has a brain that works differently, but it’s an awesome (Ryan’s favorite word) brain. It allows Ryan to hear something once and remember it. It’s a brain that won’t forget anything, including seemingly minor details about the exact day, school, and grade that I substitute taught in a month ago. He has an amazing sense of direction. We can’t get lost with Ryan in the car. Ryan will tell us when we are wrong, and he is usually right. Ryan has an awesome autism brain, and I’ll let him know that some day. Categories: Explaining Autism | Tags: autism, autistic brain, brain, questions, verbal nonverbal, what is autism | Permalink.